The night was Thursday, January 3, 2002. One night earlier, Steve Spurrier had coached his final game as a Florida Gator in the Orange Bowl against Maryland. Two nights earlier, Florida State concluded its first season with five or more losses since 1983. It was a great time to be a Miami Hurricane. The U towered above its two Sunshine State rivals. Butch Davis’s departure as head coach had hardly mattered to the 2001 team, which was about to stamp itself as one of the greatest college football teams ever assembled. Yes, the mixture of sweet relief and immense satisfaction which greets a national championship was about to wash over the Canes, but before kickoff, Miami players and partisans in Pasadena, Calif., could drink in the realization that as great as things were in the present tense, the future promised just as much if not more. 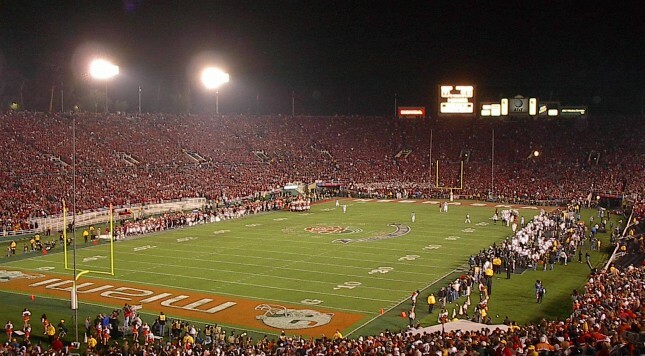 Standing on the other sideline that night in the Arroyo Seco were the Nebraska Cornhuskers. Sure, their participation in the 2002 Rose Bowl was tainted by the fact that the Colorado Buffaloes had beaten them by 26 points; won the Big 12 North; and captured the Big 12 Conference title with an upset of Texas in the Lone Star State. However, Nebraska lost only one game that season. The parade of infuriatingly familiar 9-4 seasons under Bo Pelini had not yet arrived. Frank Solich had the program under control. Eric Crouch had just won the 2001 Heisman Trophy. Nebraska was achieving at a level befitting Nebraska, the program Bob Devaney built and Tom Osborne sustained over many decades. January 3, 2002. Everything was being fulfilled for Miami. Everything still seemed possible for Nebraska. It wasn’t supposed to unfold like this. Clinton Portis ran away from Nebraska’s defense in the 2002 Rose Bowl… and prosperity eluded both the Hurricanes and the Huskers a few short years later. By the time the core of the 2001 Miami team had moved to the NFL or elsewhere, the year was 2004, and the Hurricanes had begun to settle into their new conference home in the ACC, leaving the Big East behind. Miami squeezed every last ounce of prosperity from the Big East, using the softer league schedule to win a string of conference titles and stay comparatively fresh for the biggest games of the season, such as those against Florida State. Miami’s final game as a member of the Big East, in fact, came against Florida State in the 2004 Orange Bowl. As had been the case on each previous encounter between the Larry Coker Canes and the Bobby Bowden-coached Seminoles, Miami ultimately prevailed. Coker went 5-0 against Bowden before the Florida State icon finally struck back in 2005 and 2006. The Hurricanes uncorked a six-game winning streak against Florida State, with the first five of those wins coming in the Big East years. The point was plain: When Miami joined the ACC in 2004, college football was supposed to witness a continuation of one of the great rivalries in the sport’s history. No, there would not be a Jimmy Johnson or a Butch Davis to match wits with Bowden, but that was part of the greatness of Miami football from 1983 through 2003: The program went through various coaches, but continued to thrive. Howard Schnellenberger, Johnson, Dennis Erickson, Davis, Coker — Miami did not keep its coaches for long periods. This was not Bowden at FSU, or Osborne at Nebraska, or Joe Paterno at Penn State. Miami had access and proximity to elite talent, and any coach was able to reap the benefits of geography. The Miami machine was supposed to continue to deliver conference championships and memorable clashes with the great rival from Tallahassee. The outlook was similar in Lincoln, Nebraska, albeit under very different circumstances. Yes, Nebraska was much more the product of two great men — Devaney and Osborne — establishing a firm foundation and translating their resources into many decades of success. This was not a program which won in spite of a revolving-door dynamic at the head coaching position. Had Frank Solich benefited from Osborne’s recruiting and mentorship? Of course he did. Yet, after that 2001 season, Solich had accumulated four full years as the head coach in Lincoln. If one was to make the claim that Solich was living solely off Osborne’s players, that assertion needed to be affirmed in the 2000 or 2001 seasons, Solich’s third and fourth go-rounds with the Huskers. Yet, Nebraska earned national runner-up status in 2001 — as severely as the team had lost in the 2001 season (to Colorado and Miami), it had still climbed to the top tier of the sport: below Miami, but right there with everyone else. At the very least, Solich had done as well as his critics had expected; to some, he had surpassed many pundits’ predictions when he took over for Doctor Tom. Was it true that Nebraska did not enjoy a Florida recruiting pipeline the way Miami did? Yes. However, that hadn’t stopped Big Red from cranking out one hugely impressive team after another. The brand name and a knack for winning were equally entrenched in Lincoln. Even though Bob Stoops was an ascendant head coach at the time with Oklahoma, Nebraska figured to get in its shots in the Big 12 and snare a few conference titles in the near future. Yet, here we are in the 2015 offseason. Miami has not won a single conference title — or even an ACC Coastal Division crown — in its new conference. Nebraska hasn’t bagged a league title since the 20th century: 1999. Just stop and realize how remarkable and improbable a joint occurrence this would have been to the 2002 version of yourself. With 2002 eyes, seeing into the future couldn’t possibly have envisioned a scenario in which Miami would go 12 years without a league title, and Nebraska 16. Duke and Boston College have won ACC division titles. Wake Forest has won an ACC title. Georgia Tech and Clemson have won BCS / New Year’s Six bowl games. It hasn’t just been The Florida State Show in the ACC; much of the league has accomplished something of note while Miami has languished in the middle. In the Big 12 portion of the past 16 years, Colorado won multiple Big 12 North championships. Missouri came within one win of playing for the 2007 national title. Kansas won an Orange Bowl, which used to be an annual expectation for the Huskers in the Big Eight days. If Nebraska owned Oklahoma in the 1990s, the Sooners turned the tables in the 2000s to let the Huskers know how far they had fallen under Bill Callahan. In the Big Ten portion of the past 16 years, Nebraska has seen its fabled Blackshirt defense suffer without the guidance of the most important “Quiet Man” in Husker history: defensive coordinator Charlie McBride, the man who helped the Osborne era to be as radiantly successful as it was. The memories of blowout losses to Wisconsin, fueled by defensive hemorrhages, have left deep scars in Nebraska. As Mike Riley tries to pick up the pieces from the Pelini era, he knows that this is not the same job Frank Solich had on the night of Thursday, January 3, 2002. Miami. Nebraska. Throughout much of the 1980s and 1990s, these teams were near-automatic New Year’s Day bowl participants. Once Butch Davis revived The U and Frank Solich ably took over for Osborne, these teams savored another several years of excellence. Then, just as soon as a continuation of the feel-good oldies seemed to be as certain as Miami’s defensive front or Nebraska’s power running game, the music stopped. We’re still two full months from the start of the 2015 college football season, but the air is already thick with pressure in the Heartland and in South Florida: When will Nebraska and Miami emerge from the shadows of that Thursday night, over 13 years ago? Two former juggernauts have both failed to win a single conference championship since 2003. The longer the drought continues, the more the 2002 Rose Bowl continues to be less a happy memory and more a reminder of lost power.